Summer time, weather permitting, is barbeque time. I love to cook outside over some kind of fire, it brings out the cavewoman in me. Barbeque is the closest to the original cooking, over a fire. As humans we are the only animals that cook; our big brains are due in part to the extra nutrients we get from foods when they are cooked. I maintain it’s almost impossible to feel depressed when you are in front of a fire or a BBQ. The primeval essence of fire is life affirming, balancing, grounding. There are certain nations that have become renowned for barbeque, often New World countries with plenty of land, grazing stock and some sort of cowboy tradition whereby cooking while you roam is a necessity. You will note that I’m spelling the word with a ‘q’, French-style while the Americans tend to spell it with a ‘c’ from the Spanish ‘barbacoa’, the Australians call it a ‘barbie’, the South Africans use the Afrikaans word ‘braai’; but the Argentinians, none of whom ever travel without a grill, for there is always one slung in the boot of their cars, even taxis, as I discovered when travelling in Patagonia, call it an ‘asado’. 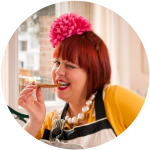 So often nobody has any idea of what to cook for vegetarians and over the next few months I’m going to be giving you suggestions on this blog. I also think it’s very important that women bbq as well as men and in that vein, I recently gave a masterclass in vegetarian BBQ for bloggers invited to an Argos garden party near Cambridge. Here are some of my tips and rules, dos and don’ts, in this post. This BBQ took place in gardening author Dawn Isaac’s place, I was very envious of her beautiful garden, each section of it like a room in a house, with different moods and uses: a children’s garden, a rose covered bower, a vegetable garden, sedum gardens planted in colanders as decoration on tables. 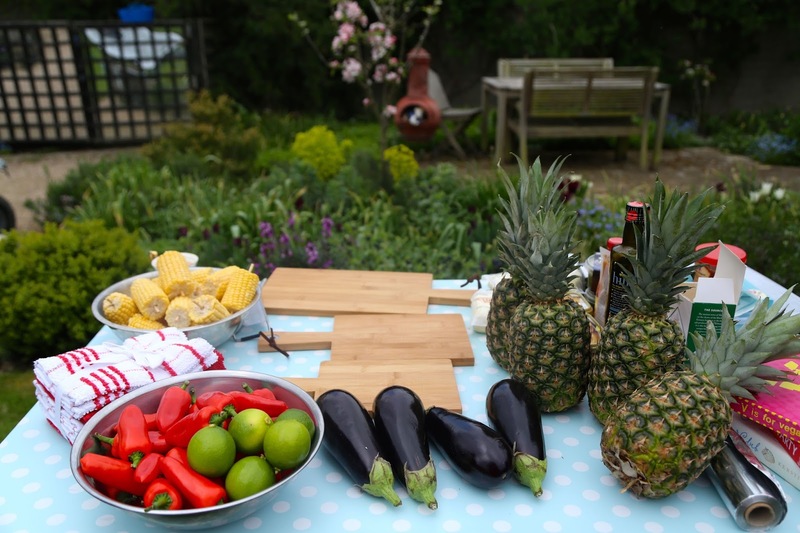 For this demonstration I made corn on the cobs with compound butter; baked miso aubergines; baby peppers stuffed with halloumi and a pesto glaze and finally, for dessert, barbequed pineapple spears with lime. If your corn on the cob isn’t very fresh or very sweet then do boil it in salted sugared (a couple of tbsp of each) water for ten minutes beforehand. This is a Caribbean BBQ trick that works very well. Kids love corn on the cob. Compound butters are flavoured butters and couldn’t be easier to make while at the same time adding a cheffy element to the dish. I made a maple syrup, a sweet chilli, and a lime and chipotle butter. Take room temperature salted butter and spoon or mash in the flavourings that you want. For instance I added 2 tablespoons of maple syrup to 150g of softened butter, then wrapped it in cling film until ready to use. For the sweet chilli, I added 2 tbsp of sweet chilli sauce to 150g of softened butter. For the lime and chipotle, I added juice of half a lime to half a teaspoon of chipotle paste to 150g of softened butter. If you want the flavours to be stronger, simply add more. 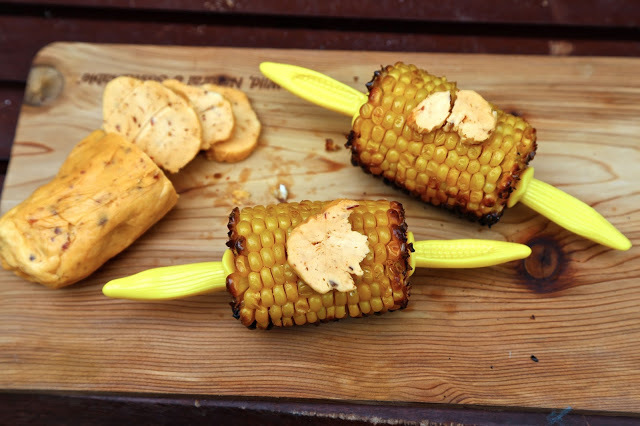 These butters melted over the grilled corn on the cob boosts flavour. If you have corn on the cobs complete with husks, soak the cob in water for 30 minutes prior to grilling. This will prevent the cob from cooking too fast. It will take about 15 minutes, turning frequently. 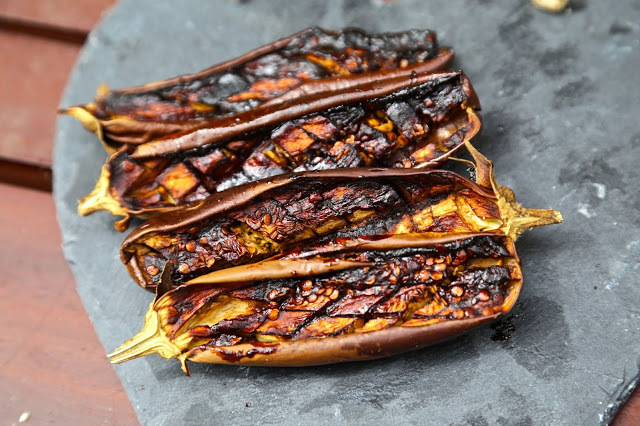 If you have frozen or other cobs, then you can either cook them in foil or brush them with oil and cook over a less hot portion of the BBQ, you don’t want the corn to burn, you want it to caramelise and become smokey with flavour. This should take about ten minutes. 10 baby peppers in red, orange, yellow, split in half lengthways and deseeded. Keep stems on. One toddler at this Argos BBQ adored these, I was suddenly his new best friend as he kept coming back for more. These are sweet peppers not the spicy ones, although you could do it with fresh jalapeño peppers or padron peppers if you want a bit of kick. 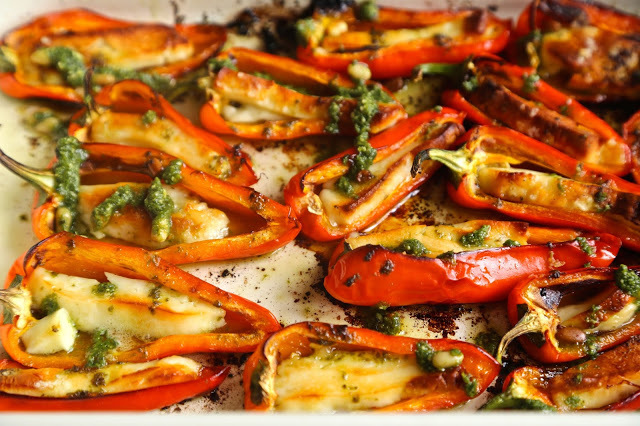 Brush the peppers halves with olive oil and scatter a little sea salt. 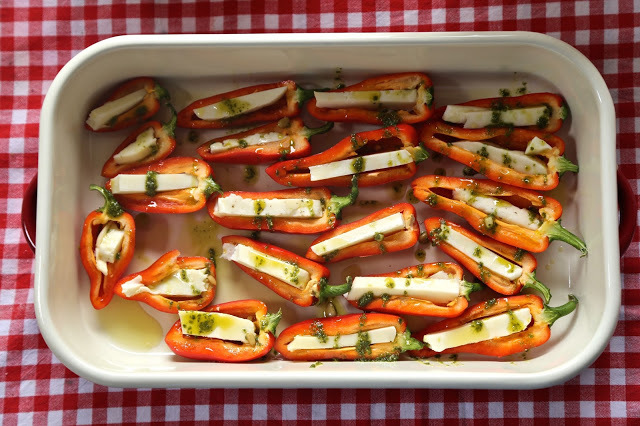 Then press a small strip of halloumi into each half. Grill on foil over the BBQ for around 15 to 20 minutes depending on how hot the grill is. Serve immediately. 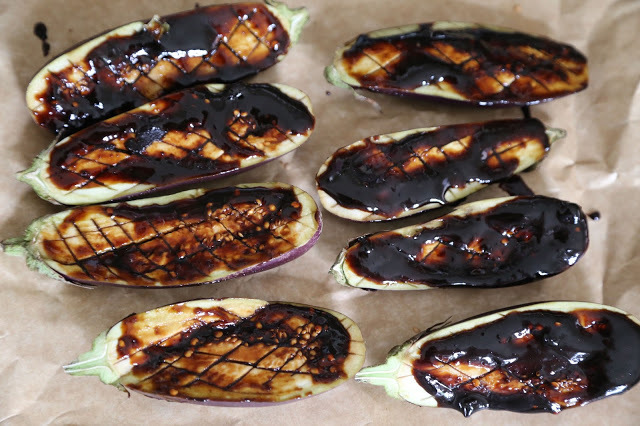 Criss cross with a knife the white side of the aubergine half. Brush the sesame oil on the white side. Place the rest of the ingredients in a small pan and warm until amalgamated. This creates a sticky sweet rich sauce. Baste this on top of the aubergine halves, the white side. Then place the halves in foil and grill for half an hour. Serve warm garnished with sesame seeds if you like. 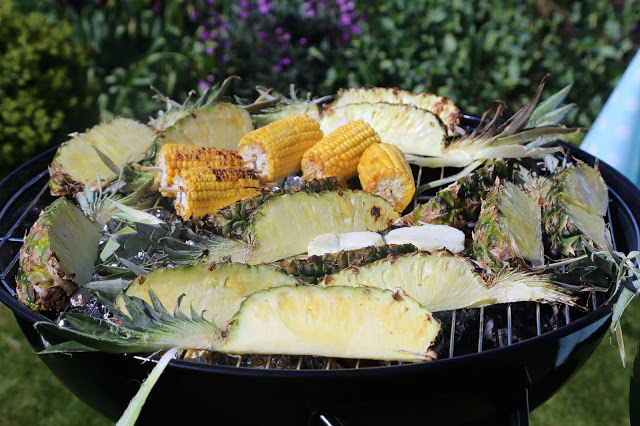 Grill the pineapple directly on the BBQ until a little charcoaled around the edges. 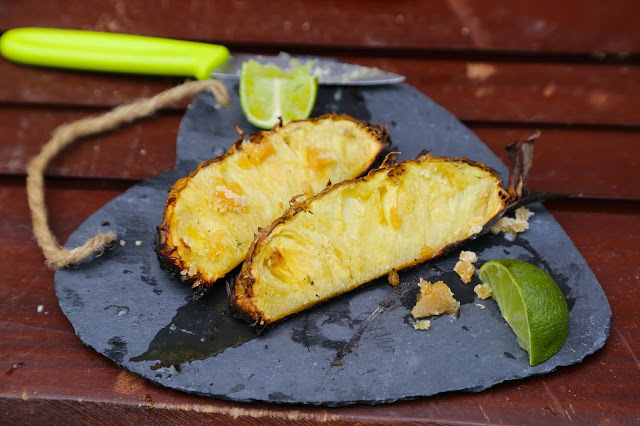 Then remove, squeeze over the lime and cut a shard shards of palm sugar onto each pineapple spear. Serve warm. Thanks for this post! We love hosting barbecues and one of my best friends is vegetarian. And everything looks so delicious!